Springbok are my favorite puzzles. The central dog reversal was interesting. For those of you who read this before doing the puzzle, there are two extra partial window panes behind the armchair. The box image does not reveal all. The tree is challenging. The puzzle showed a lack of quality by the manufacturer. The picture on the box was cut off on the left hand side and the largest dog was actually facing a different direction than pictured . My family still enjoyed getting the puzzle finished but the attention to detail was lacking on the companies part . Very nice puzzle but same comments as the 2 previous reviews dog facing the wrong direction and side cut off. Seems rather odd - never had that happen before with a Springbok. Great puzzle, but the picture on the box is shifted to the right and cut off, and the adult dog is backwards?? Also, the image quality is a bit strange, since many of the textures (paintings at the top of the puzzle, the carpet, etc) look fake. 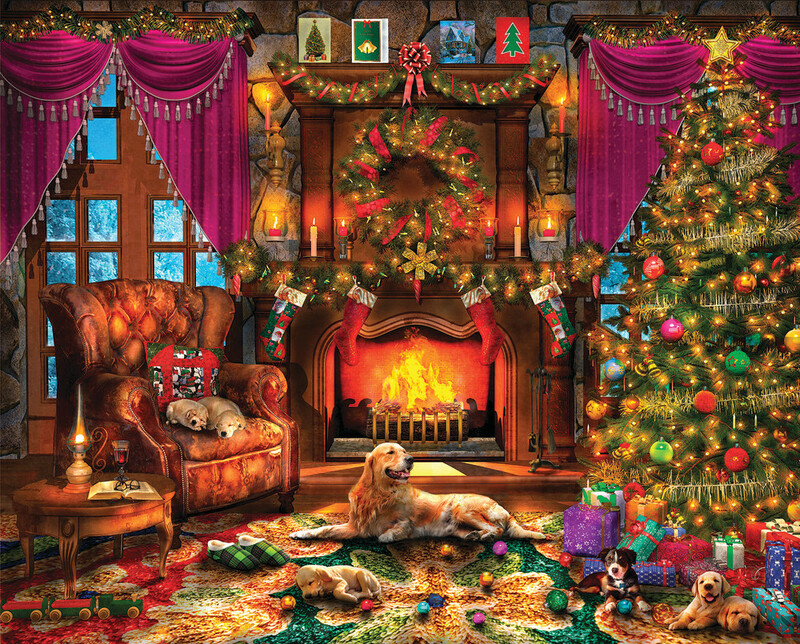 But still, such an adorable puzzle, really put me in the mood for Christmas! I loved doing the puzzle, however it proved to be a little bit of a challenge when I discovered the adult dog in the middle of the picture was reversed from the picture on the box. The whole puzzle was moved more to the right again proving to be a challenge as to where certain pieces went. All in all I did enjoy putting this puzzle together.